This guide requires an apprentice. You'll be building your apprentice as a tower character. No damage and health (you won't be fighting) and no movement speed as that is useless for this stage. Overcharge and mana burst are also irrelevant, don't put any points in them. In the early levels when you only get 2-3 points put a point in tower health and damage for 2, and tower health/damage/attack speed when you get three. Once you get four, put a point in all four tower stats. Once you start getting 5, put one in everything except damage, which gets two. Once damage is maxed, aim for attack speed, then health, then area of effect. After you have all the tower stats maxed (they cap at 70) you'll have 19 points total left over, put them in casting speed. Ideally I would suggest playing through the game once before power leveling. You'll have gained enough levels to have access to all the towers you need and some decent equipment. However if you don't wish to do this, starting off I would just suggest playing the DW map a few times to learn how the map works. Most importantly, you'll get some experience. You only have access to the magic missile tower from the start and it's not realistically possible to do this stage with just MM towers. You need to level up to get access to the rest of the towers so just concentrate on surviving as long as possible. Actively attack enemies to try and help your towers out, without barriers they will pass right by the towers. Put two missile towers at the top of the two ramps that lead up to the crystal with the mana from the chests for the first wave and keep making them. Once you can place barriers, put them on the ramps leading to the missile towers. Once you can use fireball towers, place them with the missile towers behind the barriers. You will most likely be incapable of surviving till the end the first few times you play because you don't have the better towers, this is alright, just concentrate on experience. Once you've gained access to the fireball towers (and the barriers that unlock before them) it is realistically possible to finish the stage on easy/medium. Here is a map of what your placement should look like, it was taken with a phone so it's fairly poor quality, apologies. The blue arrows are the two lanes enemies will come from every wave. The red arrows show the lanes where the big orcs will come from. They come as early as wave 3 or as late as the last wave, depending on the difficulty and number of players. If you notice, the towers are concentrated on the blue lanes, but placed in such a way that their attack cone covers the red lanes. This is important, since the vast majority of the enemies come down the blue lanes, but you obviously need to kill the big orcs coming from the red lanes as well. 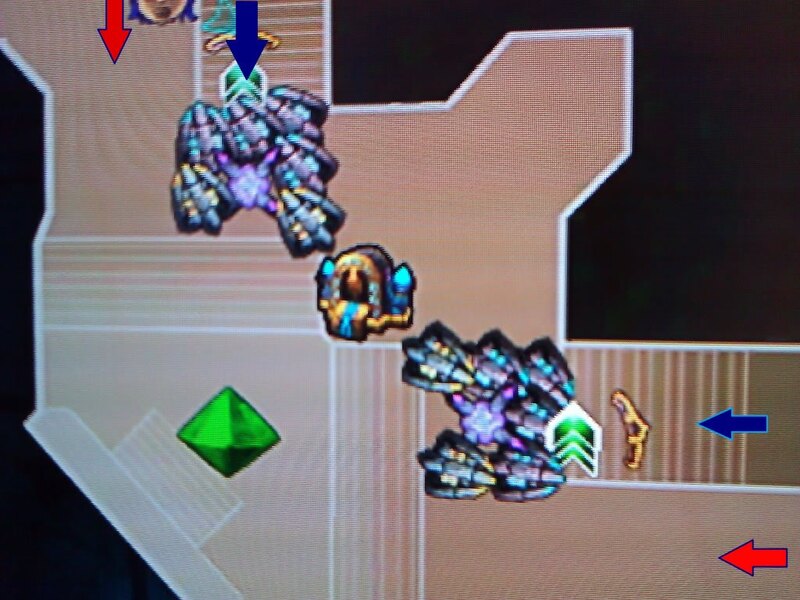 What you see there is 4 missile towers, 2 fireball towers, and a lightning tower on each blue lane. It's a tad hard to write a build guide for this, as the difficulty and amount of players dictate how much mana you get, but a rough guide would be to use the 160 from the chests on the first wave on two missile towers on each blue lane, then get the barriers up after wave 1, then the rest of the missile towers, lightning tower, and fireball towers as you get the proper amount of mana. After that, just spend mana on upgrading the barriers. Even when you unlock the deadly striker tower, don't bother with it. It does a ton of damage, but has a long reload speed and it's attack cone is smaller than the MM and fireball tower's. It might seem like a good idea for the orcs (I thought it would be), but I found replacing them with a lightning tower yielded much better results. The extra defense units this freed up allowed for an extra fireball tower on each side, which I also think helped. I did medium DW up until about level 20, then switched to hard around 25, and then did insane around level 30. I started doing two players around level 40. The significance of using multiple players is that you can use multiple classes from the same GT's account. This means you could have your second controller be your huntress for example. Since every character gets experience after each wave regardless of participation, this allows you to level up multiple classes on the same account while only actually using one. An accomplishment (which is tied to an achievement, the one for getting all accomplishements) requires you have each of the four classes at level 70, which is the main point of doing this. At around level fifty 3 characters should be doable, and after 55-60 4 players should be easily doable. You might be able to do it earlier if you get your hands on some good equipment, so keep an eye on the shop whenever you are in the tavern. It's not really necessary to upgrade your equipment to do this map, but if you want to do so, only upgrade the tower abilities as they do the vast majority of the work. Although this is out of the scope of the achievement, I'll mention this : you can change heroes during the build phases. Once you get your apprentice to 70, remove one player (and it's controller) and then after you build your towers in each build wave with the apprentice, switch your apprentice out for the character you removed, using the forge. They'll get experience for the monsters the apprentice's towers kill. The extra experience isn't much, but it helps. After the wave ends, switch back to the apprentice and build towers, and then repeat as necessary.